Rock-Paper-Scissors in Grand Kingdom | NIS America, Inc.
Everyone has their favorite gameplay style, right? I flip-flop between wanting to tank everything and needing the excitement of living life like a glass cannon. Since Grand Kingdom lets you put together squads of up to four units from various classes, you can be super flexible with how you want to live your mercenary life. It's important to consider the types of units in your squad though, because a careful balance exists between them. There are three basic class types that operate on a bit of a 'rock-paper-scissors' mechanic: Melee, Ranged, and Magic units. Melee units can have trouble dealing with Magic units, but if they get in close under the guard of Ranged units they can do real damage. Ranged units can give Magic units a beating, but need to be careful with Melee enemies. And then those Magic units—if you haven't guessed yet—can do real damage to Melee units, but may end up struggling with Ranged foes. In addition to these unit types, there are also Specialist units that fulfill very specific roles in battle. You can discover more about each type of unit on our website update, but for now I'll dive in to each type for a closer look! Well, obviously we're gonna start with the melee units. These guys do a lot of what you'd expect from melee classes. They like to get in close and duke it out with the enemy. If you're looking for a melee master, you'll be picking from a solid group. The Fighter is the traditional sword-and-shield kinda guy. If you want some defense with your offense, he's got you covered. The Blacksmith wields one heckuva hammer. (I mean, seriously, that thing's bigger than her!) As you might expect from the blacksmith life, this lady packs a whallop, but you're not going to have a huge reach. The Rogue does what you'd expect a rogue to do. She'll dart, dash, and poke the life right out of your enemies. Those knives are sharp, dood. Each of these classes has some interesting nuances in their use, so make sure to check out our character page to see a bit more about them. Now, that face-first attitude is gonna leave them a little bit exposed to certain types of enemies, but if makes them ideally suited for turning the lights out on our next group of units, the ranged classes. I mean, what would you expect from a fellow fighting with a gun or bow? It's hard to fend off somebody's sword with your bowstring. These units are invaluable to include in your team, and depending on the lay of the land you're fighting on, they can have some pretty awesome advantages. The Hunter excels at picking out enemies in the back lines, and making them regret not bringing a steel umbrella. The Gunner may look old, but that's just because I didn't dye his hair in unit customization. He wields a gun so powerful that one shot can hit more than one baddy right between the eyes. Not all magic users are meddling. But sometimes, that's just what you want. These units can wreck havoc on the front lines of enemies and leave their defenses wide open for the rest of your mercenaries to slice-and-dice. The Shaman wields the powers of her life force to curse her enemies. Seriously, dood. She's holding a crystal skull. I know I wouldn't wanna face her. The Arcanist uses spells (I bet he finds them in that there book he's carrying!) to lay waste to those who face him. If you've ever wanted to watch the world burn... well... I might have the mercenary for you. The Witch doesn't actually ride on a broom, but she does have some saucy magic at the ready. It's almost like that pointed hat is just waiting to sort her enemies into teams: roasted, done, finished, or kaput. Because of their AoE skills and ability to tear holes in the opposition, you'll probably find yourself making use of magic units to stomp out melee classes before they get close enough to make your ranged units into filet mignon. Of course, someone could always throw a wrench into your perfect rock-paper-scissors strategy by employing a unit with a very special use from the, wait for it, specialist category. Don't forget about these guys, dood! Specialists are units that don't quite fit the mix of any of the more 'regular' classes. They each have something special to add to a team, but they also have drawbacks, so you'll want to use them carefully! The Medic does just about what you'd expect. She keeps your squad topped up in the life department, but if you're not careful, you may end up healing the wrong person! Having a Medic will keep your squad alive longer, but you'll have to give up some damage ability in return. The Challenger has that big ol' barrel full of.. well, I'm not really sure what exactly. I do know that it goes 'BOOM!' (Gah! What if there's a Prinny inside...?) He can use it to blast enemies all over the place, but he can end up catching some flack himself sometimes. The Dragon Mage is... well, she's a mage on a dragon! She can be pretty versatile by doing long-ranged magic damage, or hopping on Pop (That's what I named the dragon.) and tearing through enemies from up close. She technically counts as two units though, so you'll have to be smart about using her in a squad. That pretty much wraps up the standard classes in Grand Kingdom! 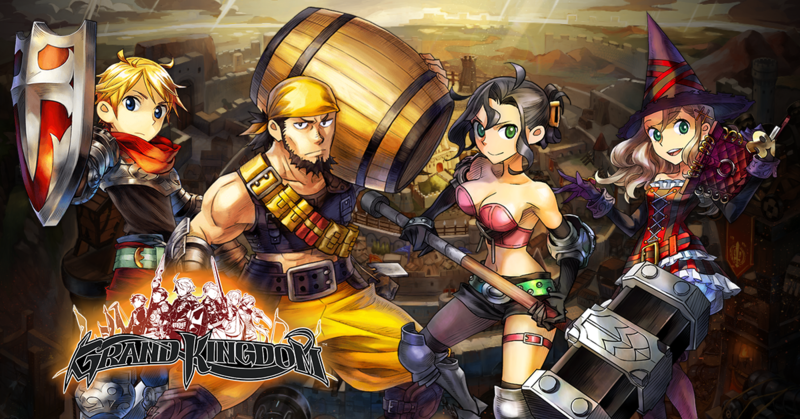 As a special bonus, we've decided to include the Noble class standard with every copy of Grand Kingdom! In Japan, this class was DLC, but we'll be making sure that everyone has access to her expert offensive abilities! If you want to learn more about the Noble, or any of the classes I mentioned, check out the classes section on the official website! I'm off to practice with my all-medic squad! Until next time, dood!